Emblem measures approximately 2 3/4 inches wide by 2 3/4 inches long. If you are looking for an exact size and color match you must provide your Vipers complete VIN number. NOTE: If you are trying to match the exact year and color of your Viper - email us your VIN number. If you are selecting "Exact Match" you must provide us your Vipers VIN Number in the Notes section once you order. 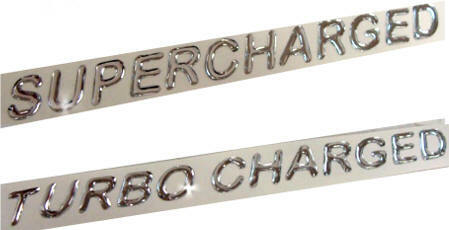 Stainless Steel High Polished Letters for Bumper emblem replacements. There is no background the set of letters peels off and sticks on to your cars body. 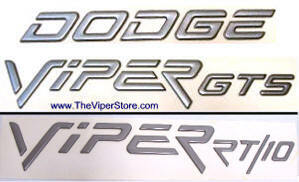 Stainless Steel High Polished letters, overall sizes: "VIPER RT/10" 1 ¾in. X 10in. 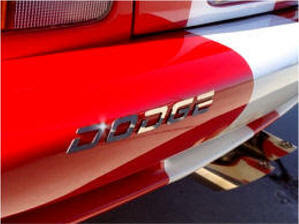 and "DODGE" 1in. X 8in. Your stock emblem letters on your Fender and back bumper peel off easily without damaging your paint. Replace them with these Stainless Steel High Polished letters! 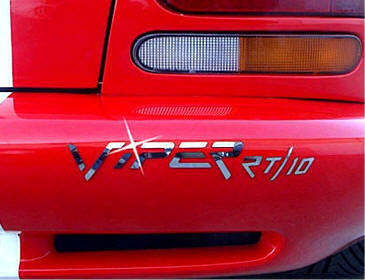 What a difference these logos make on your Viper! 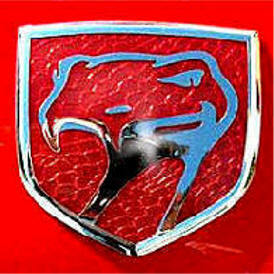 You receive one VIPER RT/10 and one DODGE Stainless Steel emblem. SIZE: Similar size as stock bumper emblems. 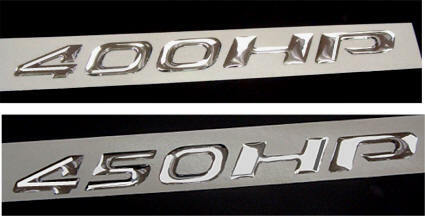 Stainless Steel High Polished Letters for Fender emblem replacements. There is no background the set of letters peels off and sticks on to your cars body. Raised letters, overall size: 2 ¼" X 13"
Your stock emblem letters on your fender and back bumper peel off easily without damaging your paint.. Replace them with these Stainless Steel High Polished letters! 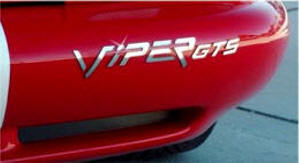 What a difference these logo letters make on your Viper! You receive TWO emblems one for each fender. Fits passenger and drivers side. SIZE: Similar size as stock Fender emblems. There is no background the set of letters peels off and sticks on to your cars body. 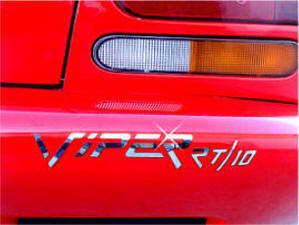 Raised Stainless Steel High Polished letters, overall size: "VIPER GTS" 1 ¾in. X 10in. and "DODGE" 1in. X 8in. You receive one VIPER GTS and one DODGE Stainless Steel emblem. There is no background the set of letters peels off and sticks on to your cars body. Raised Three dimensional letters, overall size: 2 ¼" X 13"
3-D Raised Chrome vinyl letters indicating Horse Power for your vehicle. Item is for one emblem - Chose 400HP, 450HP, or if you have performance mod's use: 500HP, 550HP, 600HP, or 640HP. Size: 1/2" x 5 3/4". Includes one emblem of your choice. Approximately 4 inches long. If you have performance mod's to your Viper than you have a higher HP. Chrome raised Plastic letters indicating Horse Power for your vehicle. Item is for one emblem - Chose from 400HP to 700HP if you have performance modifications like a full exhaust system. 1 emblem Can be mounted on the engine, in the engine compartment, in the interior or on the body or anywhere else you like. (For custom emblem - simply call us 352 688 8160.) Can be mounted on the engine, in the engine compartment, in the interior or on the body or anywhere else you like. 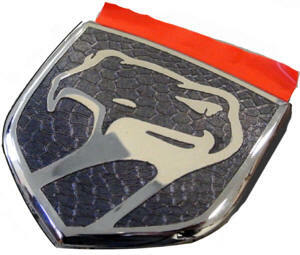 Original Factory emblems in Silver, Blue, Red, Yellow, Green, or any other stock color you want. All emblems will fit on all 92-02 Vipers. NOTE: For exact matches to your Viper we will need the last 8 digits of your VIN. **Black is no longer available. 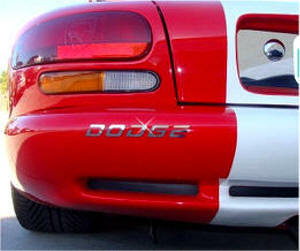 JUGC53MD5SO Front fender emblem "Viper RT/10"
JU4848943AASO Front fender emblem "Viper GTS" We can get any color - just ask! For other colors please call.